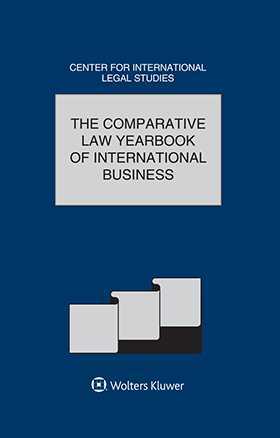 The thirty-seventh issue of the Comparative Law Yearbook of International Business examines current issues and developments under the broad headings of finance and investment, corporate law, contracts, and dispute resolution. In the finance and investment section, practitioners examine issues relating to the recapitalization of Greek systemic banks, foreign investment in Brazil’s healthcare sector, and Spain’s Venture Capital Act. The acquisition of companies in Peru and the “responsible corporate officer” doctrine are examined in the corporate law section. In the contracts section, lawyers discuss remedies for breach of contract in Brazil, Italian contractual aspects of cloud computing, incorporating UNIDROIT principles into international commercial contracts, and setting up distribution channels in Brazil. Four subject areas are considered under the dispute resolution heading: expert determination in merger and acquisition disputes, the enforcement of international arbitral and judicial decisions, the recognition and execution of foreign arbitral awards in Cyprus, and investor-state arbitrations.